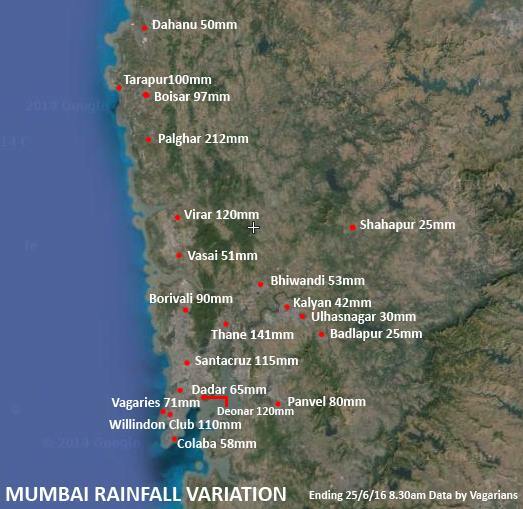 The first to reach 1000 mms this season was Malvan (Konkan) on 24th June: Few more followed on Saturday 25th: Season's Rainfall Totals as on Saturday Morning 25th: Malvan 1126 mms, Mormugao (Goa) 1059, Harnai (Konkan) 1051 mms,Dabolim (Goa) 1033 mms, Cherrapunji ( Meghalaya) 1015 mms. Mawsynram (Meghalaya) is 1050 mms (yet to be confirmed). 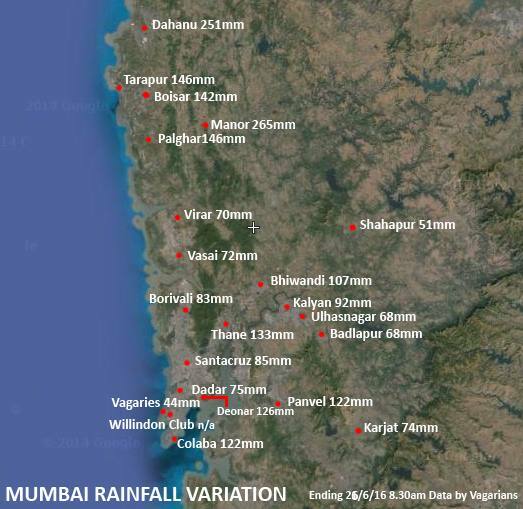 8.30 am - 5.30 pm Saturday...Colaba 96 mms, Scruz 35 mms, Alibag 149 mms, Dahanu 134 mms. Ratnagiri 86 mms. Rajesh sir,please forecast for north konkan also in written.